At the risk of sounding trite, I've got to say that you seldom get old-fashioned fudge anymore. You are more apt to get the no-cook, marshmallow cream-powdered sugar variety. Ho hum. Not that it isn't good, but there is just no comparison to a homemade, "real-candy" recipe. Sink your teeth into a piece of this old-style Texas chocolate fudge. When you feel it melt on your tongue, you will know the difference. Is it trickier to make? Yes. More difficult? Somewhat. But it's worth it. The recipe looks simple enough. Ingredients are about as basic as you can get. From firsthand experience, I can recommend the use of whole milk, but the real secret of success to this recipe, and just about all candymaking, is in the timing. If you know how to determine soft-ball stage (approximately 238 degrees) with the cold water test, you will have no difficulty. If you don't, then see the instructions below, or use a candy thermometer so you will be certain. Also, do not start beating until the temperature drops to 110°F. About the beating: I use an electric mixer. My mother (the "Grandma" in question) never used anything but a big old spoon and her strong right arm. I can see her still, sitting in a kitchen chair holding the pot on her lap, handle in her left hand, spoon in her right. And the spoon made a wonderful clop-clopping sound as she beat the thickening fudge. I don't know how she did it, but her fudge was perfect every time. 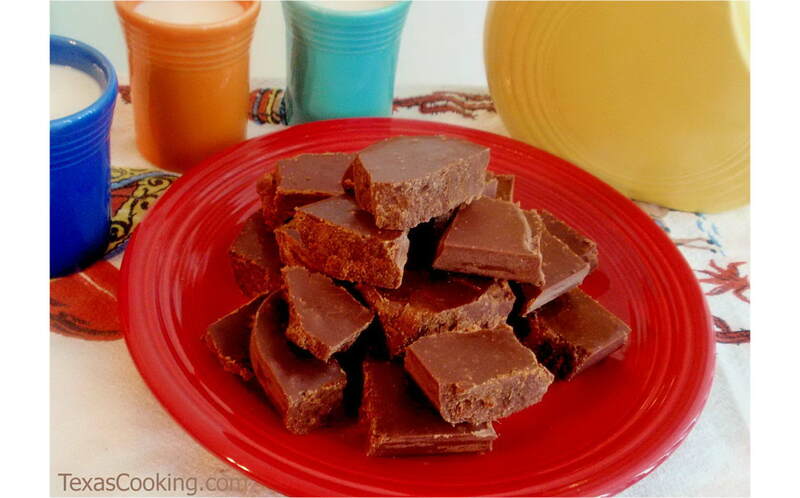 Of course, my mother was a "chocoholic," (she didn't know it because the term had not yet been invented), so she made this fudge often, and that is the real key to success -- experience. Now that I've made it sound as potentially hazardous as mixing up a batch of TNT, I will try to dispel any fears I may have created. I urge you to wade into making this fudge. I think you, your family, and friends will agree that it's worthwhile. Butter an 8-inch square pan or dish. Thoroughly combine dry ingredients in a large, heavy saucepan. Stir in milk. Bring to a full rolling boil on medium heat, stirring constantly. Then boil, without stirring, until mixture reaches soft ball stage (234°F on a candy thermometer). Bulb of candy thermometer should not rest on bottom of pan. Do not stir. Remove from heat. Add butter and vanilla to mixture, but do not stir. Allow mixture to cool, at room temperature, to 110°F degrees (pan is barely warm to the touch). Beat until fudge thickens and begins losing its gloss. Quickly spread in pan. Let harden, and cut into squares. Serves 6.. The cold-water test for soft ball stage is this: Fill a cup with very cold water. Spoon a small amount of the boiling candy mixture into the cold water. If the syrup forms a soft ball in the water that flattens when removed, it is at soft-ball stage. Quickly remove your candy from the heat, or you will find yourself at hard-ball stage, and your fudge will be too hard.